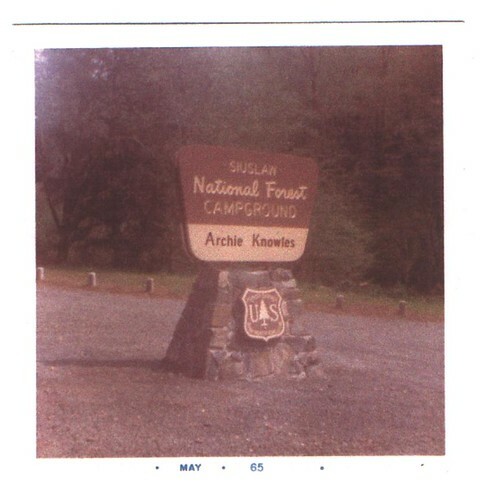 The Archie Knowles Campground, originally uploaded by DianthusMoon. Someday I hope to see my family ‘homesteads’. They settled in New Hampshire from the 1600s to 1850s. Some went on to Minnesota before finally settling in Oregon. My gr.grandfather was one of the first forest rangers out there. His wife Margie wrote a book about their experiences called ‘Honeymoon on Horseback’. I think I have shared this before. What is neat is what I found in the big photo genealogy book that my cousin Ann compiled back in 2004-the Siuslaw National Forest Campground that was named for my gr.grandfather. I’ve only met my cousin Shirley and her husband when I was a little girl. Ann is her sister. I did correspond off and on with their mom, my great aunt Dessa. Now I correspond with Ann. I haven’t heard from her lately, but her husband has a Flickr account. They built a half circle home (best way to describe it) in Colorado on their son’s property over the last year or so, guess that is keeping her busy. Why am I taking an interest in all this? Partly because of the summer show ‘Who Do You Think You Are?’ where they researched some celebrities family history and we really enjoyed it. And also because my middle brother opened an Ancestry.com account. Need to work on my collage soon! Just having a lazy day. The auction is next weekend and it looks like mostly high priced stuff, but we can go to the preview and leave.